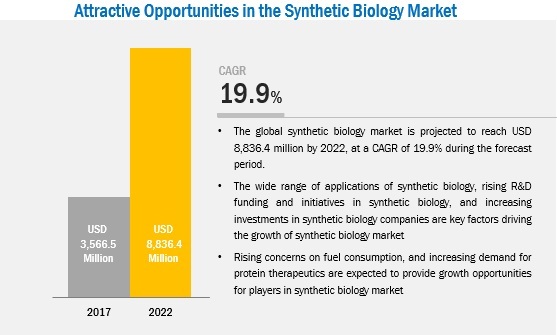 [214 Pages Report] The global synthetic biology market is expected to grow from USD 3.57 billion in 2017 to USD 8.84 billion by 2022, at a CAGR of 19.9% from 2017 to 2022. Synthetic biology has an array of applications in the fields of medicine, agriculture, nanotechnology, and industrial biotechnology. This has attracted interests of researchers from across the globe and has led to a rise in funding from public and private organizations, which, in turn, help in the growth of the market. Additionally, the reduction in costs per raw megabase of DNA sequencing and a drastic reduction in the cost of synthetic genes is expected to propel the market growth of synthetic biology. The base year considered for the study is 2016, and the forecast has been provided for the period between 2017 and 2022. The field of medicine has been in the forefront in terms of developing and applying synthetic biology techniques for various applications. Advancements in DNA sequencing and synthesizing technologies have resulted in the better understanding of diseases, aiding the research and discovery of biopharmaceuticals, small molecules, regenerative medicine, and antibody research. Additionally, synthetic biology has major applications in developing disease-resistant, drought-tolerant, and high-yielding crop. Similarly, industrial applications of synthetic biology are expected to replace petrochemicals with bio-based chemicals in the near future. The growing applications of synthetic biology is a major driver for the growth of this market. 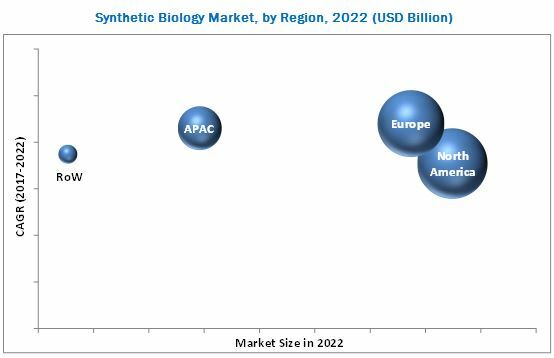 The synthetic biology market comprises a network of players involved in the research and product development; raw material supply; component manufacturing; distribution and sale; and post-sales services. 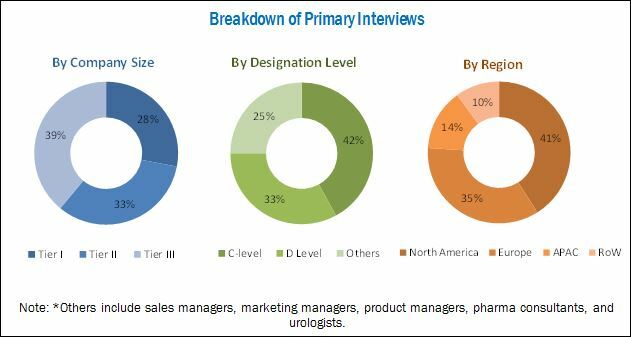 Key players considered in the analysis of the global market are Thermo Fisher (US), Novozymes (Denmark), Merck KGaA (Germany), Intrexon (US), and Agilent Technologies (US), Amyris (US), GenScript (US), Ginkgo Bioworks (US), Integrated DNA Technologies (US), New England Biolabs (US), Synthetic Genomics (US), and Twist Bioscience (US). In 2017, Thermo Fisher (US) collaborated with AstraZeneca (US) and offered its CRISPR technology to AstraZeneca’s entire drug discovery platform. In 2017, Ginkgo Bioworks (US) acquired Gen9 (US), a Cambridge based gene synthesis company. 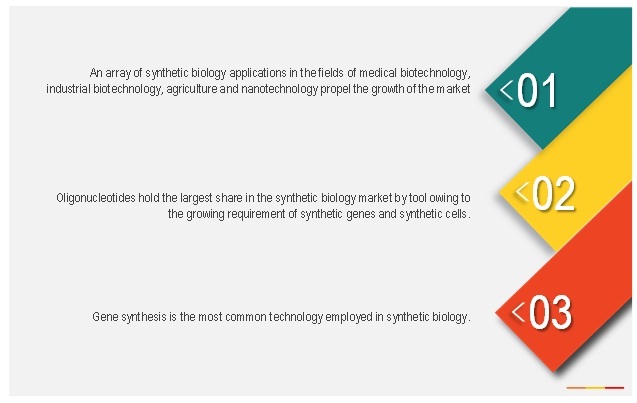 What are new application areas which the synthetic biology companies are exploring? The global synthetic biology market is expected to grow from USD 3.57 billion in 2017 to USD 8.84 billion by 2022 at a CAGR of 19.9%. This high growth rate can be attributed to the wide range of applications of synthetic biology, rising R&D funding and initiatives, increasing demand for synthetic genes and synthetic cells, and increasing investments in synthetic biology companies. Factors such as rising concerns regarding fuel consumption and increasing demand for protein therapeutics are expected to offer lucrative opportunities for players in the market. Synthetic biology can broadly be described as the engineering and design of new biological parts and functions such as artificial biological pathways and organisms, which can further be used to produce end-products such as biofuels, biosensors, etc. Synthetic biology also includes the redesign of natural biological systems. In this report, the global synthetic biology market is segmented on the basis of tool, technology, application, and region. Based on tools, the market is segmented into oligonucleotides, enzymes, cloning technology kits, chassis organisms, and xeno-nucleic acids. In 2017, oligonucleotides are expected to account for the largest share of the global market owing to the large-scale production of modified oligonucleotides for next-generation sequencing and the increasing market demand for synthetic genes. By technology, the market is segmented into gene synthesis, genome engineering, cloning and sequencing, next-generation sequencing, site-directed mutagenesis, measurement and modeling, microfluidics, and nanotechnology. In 2017, the gene synthesis segment is expected to account for the largest share of the market in technology. This is attributed to the fact that the technology is used in a wide range of applications such as producing vaccines, engineering enzymes to restrict cancer growth, producing sustainable biofuels, improving crop yield, and detecting and breaking down environmental pollutants in the soil, air, and water offered by gene synthesis. The market is segmented into medical (pharmaceutical, drug discovery & therapeutics, and artificial tissue and tissue regeneration), industrial (biofuel & renewable energy, industrial enzymes, and biomaterials & green chemicals), food & agriculture, and environmental (bioremediation and biosensing) on the basis of application. The pharmaceuticals subsegment is expected to account for the largest share of the market. However, biofuel and renewable energy is expected to grow at the highest CAGR during the forecast period owing to the global demand for fossil fuel alternatives and the advantages of the genetically engineered organisms for the synthetic production of biofuels. The market in Europe is expected to register the highest growth rate from 2017 to 2022. The rising international alliances between the European countries and other countries and heavy funding from the government to foster the synthetic biology research in Europe are major factors driving the growth of market in this region. Additionally, factors such as increasing investments for the adoption of novel synthetic biology technologies, rising R&D funding and collaborations are driving the growth of the market in this region. Synthetic biology is also used to develop bio-based chemicals to replace petrochemicals in the coming years. Bio-isobutene developed using synthetic biology can be used in the production of biofuels, tires, lubricants, and plexiglass. Additionally, companies are investing in the development of bioisoprene for the production of bio-based rubber tyres. Notable advancements in DNA sequencing and synthesizing technologies have benefited in the better understanding of diseases and subsequently aided the research and discovery of biopharmaceuticals, small molecules, regenerative medicine, and antibody research. Additionally, the genetic manipulation of biosynthetic units in microorganisms has opened a new channel for the industrial production of biopharmaceuticals, such as vaccines, antibiotics, and antiparasitics (Artemisinin being a huge success). Genome engineering has enabled the industrial enzyme industry to obtain higher yielding, higher activity, more efficient, effective, and dynamic enzymes for the textile, food, detergent, and dairy industries. Similarly, bio-based synthetic chemicals such as alcohols (ethanol), acids, and olefins; biodegradable plastics (corn-based plastics); and plant-based cleaning supplies are eco-friendly consumption alternatives fitting into the current need for clean and green environment, globally. What are the upcoming industry applications for synthetic biology? While the overall market is expected to grow at a high rate, possible environmental and security issues related to synthetic biology is likely to restrain the growth of this market to a certain extent. The release of synthetic organisms in the environment can lead to adverse environmental impacts. For instance, synthetic microbes, when released into the environment, can mutate or interact with other organisms, resulting in cross-breeding with natural organisms and creating bioerrors. This can threaten the ecosystem of natural organisms. Moreover, the field of synthetic biology creates a risk of engineering bioterrorism weapons. Key players in the global market include Thermo Fisher (US), Novozymes (Denmark), Merck KGaA (Germany), Intrexon (US), and Agilent Technologies (US), Amyris (US), GenScript (US), Ginkgo Bioworks (US), Integrated DNA Technologies (US), New England Biolabs (US), Synthetic Genomics (US), and Twist Bioscience (US). These players are increasingly collaborating, and partnering with companies to offer their synthetic oligonucleotides and to develop synthetic organisms.